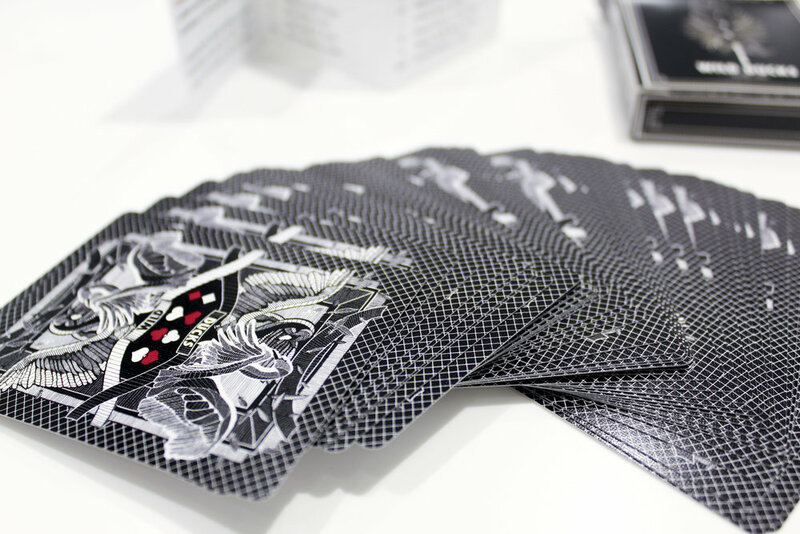 A global collaboration across IBM Design to illustrate a playing card for a shared deck. Collaboration between IBM Design and Playing Arts to showcase design style from across the globe. The Ask: Create an illustration that will be added to a collaborative deck of playing cards. My Work: I was selected to design the card for the Jack of Diamonds. It took me a while to come up with the concept for this card design. I started by looking at the meanings behind the name "Jack". I also thought about how I could play with the diamond shape. The final design direction didn't come to me until I was on a road trip with my friends. We started just brainstorming ideas and one of my friends said "Lumberjack!" The second I heard that I immediately pictured a buff, axe-yielding lumberjack. Once I had the image in mind, I began sketching some concepts for the card design. I used a mixture of organic shaped with sharp angels to create a dynamic form for his body. You can see my one of my ideation sketches here. I began coming up with the personality I wanted the lumberjack to have. You can also see how I was beginning to incorporate the diamond shapes in my design. Next, I moved over to Illustrator to begin bringing the design to life. I picked my color palette and used bold geometric shapes to get the details across. Playing with the diamond, I worked this form into both the lumberjack's axe and the mountains. I reconfigured the elements in the design until I was happy with the illustration. Then, I added the illustration to the card design to see how it would look. After that I sent off the design to see my (lumber)jack of diamonds complete. Here are some photos of the deck that was created.